Walmart? A Pioneer in Customer Service? What?! When you think about Walmart, you don’t always think great customer service. You think low prices. Amazon is a huge competitor for Walmart. Trying to keep up a mail order system, Walmart has had to start thinking outside the box. Finding new ways to appeal to their customers and re-develop their systems. Out with old and in with the new. Walmart reset their model, started focusing on customer service and hiring new employees in key areas of their stores. Have you heard of or tried the Walmart grocery pickup service? It’s phenomenal. Makes life easier. Order your groceries online, choose a convenient appointment time for pick up and have your groceries loaded into your car without setting foot in the store. Michael is my Walmart concierge. (Sounds super fancy and a title he rightfully deserves.) He knows when I’m leaving my house to pickup my groceries thanks to their smartphone app that I use to check in online and it follows my car. So when I arrive, he walked out the door with my groceries all sorted and ready to load. Each time he greets me by name and on Mother’s Day, he presented me with a signed card from the entire grocery pickup team. Talk about a WOW experience. On my first visit, they presented me with a gift bag that included gourmet soup, a high-end granola bar, and a hand moisturizer. The gift bag doubles as a small lunch bag so when I bring it into the office, it’s always a conversation starter about their service. Also in the bag, I got a card to give to a friend for $10 off her first order and I also got a $10 credit for a future order. Seems they have their care to share systems firmly in place. I don’t have to drag my kids in the store or search for things when they rearrange their shelves or move the coconut milk for the 30th time. I don’t over spend, no impulse buys and in turn my grocery bill has gone down. And best of all…this new service doesn’t me anything extra. Walmart makes it SO EASY to choose them! They found a way within their existing model to provide a higher-level service. What about you? What can you solve for your patients? How can you simplify things for them? How can you stand out? I want you to sit down and brainstorm with your team. Focus on building loyalty and how to be the customer service leader in your industry. One easy way you can really set yourself apart and all it takes is a smile and a handshake. I have one simple way you can make dramatic differences in your business (and your life) that costs nothing but a smile. If you employ this one little technique you will really differentiate yourself and your business to the next level. It’s something your mom probably pounded into your head as a child but as adults in the trenches of day-to-day life, it has slipped away from us. I’m talk about being nice and upping your social game. Now, I know you are a nice person. I don’t need to remind you of that. But I’m talking about body languaging and social patterns that increase connection and conversions. This is one asset that will really transition you from where you are to where you want to be. When you are in the business of customer service of any kind, social skills and certain actions are imperative to the success of your business. You can’t have one without the other. I know you are obviously engaging in some conversation with your patients and clients, how would you get anything done? I’m talking about taking the next step. Stop talking to them from behind a counter at the front desk. Stop talking to them when they are laid back in your chair and you’re behind them talking through your mask. You need real face to face, eye to eye conversation. If you’re a mechanic, for example, and you’re giving your customer the rundown of their car, make that extra effort. Walk around from behind the counter, shake their hand, be personable and talk to them. Make eye contact. Remove those subliminal barriers between you and them. These small efforts will stand out more than you know, especially in today’s norms. Teenagers today hardly know how to have a face to face conversation because all their interaction is through social media and texting. So it’s more important now than ever to take that extra step. You will really set yourself apart with your patients and customers because this minor detail is probably getting overlooked by your competitors. We dive deeper into this on the video so make sure you check it out. No matter how large your practice grows, always treat each patient as if they are your only patient. I’m live from the Bahamas while on vacation with my family on a Disney cruise for this week’s tip. Since I’m always looking for tips and strategies to share with you to grow your practice and get more patients, I decided to set up my camera right there on the beach and shoot you a quick video. I’m sure you know by now I am an avid Disney fan, not only because of the products and services they offer, but for their desire to provide exceptional customer service. The boat was docked at Disney’s private island Castaway Cay, which serves as a private beach exclusive for Disney cruises. When you watch the video I show you the beach we were hanging out on, along with a few thousand of our closest Disney friends. But while there are a lot of people here all at once, it doesn’t feel packed because Disney is very good at crowd control. And that is where the insight I want to share with you ties in. If you have a busy office, you don’t want to patients to feel like one in a massive herd. You want to be sure everyone feels like they are getting the VIP treatment and feels appreciated each and every time. This is where I feel Disney is such a great business to showcase because they do a lot of little things well to maintain the experience. In the world of high dollar investments, (and dental care falls into that category, too) to remove yourself from the commodity trap, you have to focus on the customer’s experience and how you made them feel. Disney is always evolving and ‘upping’ the customer experience to the next level and you should be doing the same in your practice. I want you to run through what the total start-to-finish patient experience is in your practice. Then sit down and think about what you can do to improve it. Just like sitting on the beach at Disney, or their dinner service, even when you are one of their 4,000 guests, you don’t feel like you’re just another number. They go above and beyond to ensure everyone is having a great time. So even though you are growing in your practice and your patient numbers, you should always maintain the same level of service. Never lose that. How everyone in your practice, from top to bottom, can improve your patient’s experience. When you are searching for inspiration to grow your dental practice, the obvious choice is to look at big companies who are blazing the trails to take notes from. I do this myself in growing my own business. And one of the best companies I have found to emulate is Disney. I am a big fan of the company for a lot of reasons, one of which is they are a very successful company who strives to always ‘wow’ their customers and do it with a smile. Disney is known for their ability to hire stellar employees with the ‘customer is always right mentality’ while doing it with a smile. Customer service is imprinted into every employee from the trash collector to management. No job is beneath anyone or above anyone’s job title when it comes to creating the ultimate customer experience. I showcase 3 real life incidences from Disney and how they took a problem and turned it into an opportunity to build customers of life for you to study and apply to your dental practice to get and keep more patients that I share in this strategy video. It takes a team to run a business, while also providing excellent customer service. While everyone has different roles, no one should have the attitude of they are too good for a job. In the video I explain the person in your office is giving the first impression in your office and how they are most likely the least trained. And I tell you the biggest red flag I have often heard in interviews that lets you know someone isn’t right for your office. 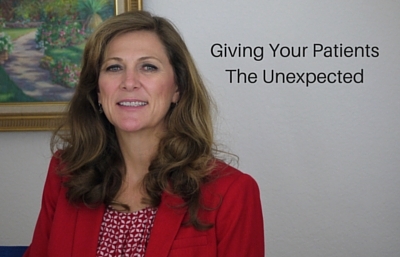 Diverting your patient’s negative experience, turning it into a good one. I have been sending you lots of great business insight from Disney after my most recent visit to the park and I’m not done yet. With Disney starting from the ground up from nothing to today being one of the biggest entertainment franchises in the world, they are a great business to take examples from to help you get and keep more patients in your dental practice. I’m back in the studio this week and wanted to share another great point – their exceptional customer service and the ability to refocus the negative. While the Disneyland was completely amazing, it was also very hot, crowded, and involved a lot of waiting around. One of the crowd favorites (as well as my family’s) is Toy Story Mania. If you’re familiar with Toy Story, a lot of the main toy characters are classic toys. They have the slinky dog, Mr. Potato Head, and the Etch-A-Sketch. So we’re waiting in line, for what seemed like forever, in the heat, surrounded by hundreds of other people (making it pretty smelly), and people are getting cranky and we noticed workers handing something out. Disney being Disney isn’t just going to leave you out there on your own. Workers were walking around handing out miniature versions of the Etch-A-Sketch for everyone to play with while waiting in line. It’s exciting because it’s something fun that we weren’t expecting in what was otherwise becoming a very annoying situation. I’m sure most everyone in line had a smart phone or some type of tablet they could have played on to keep their minds occupied. But it was the simple act by Disney to refocus on what we couldn’t control and replace it with some entertaining, it did something to take that experience to the next level. Making a potentially bad experience into a good one. Suddenly, it doesn’t feel so hot outside, time is going a little faster, and you don’t notice the negativity because you’re playing with a (completely unexpected) toy. When you watch the full video I will give you examples of how you can apply this thinking in your dental practice. I even share with you what one of my private clients offers to his patients while they wait for their appointment. You will be blown away how they are giving their patients the spa treatment (for FREE!) while they are waiting in the lobby and in turn, it increases case acceptance to keep your schedule full. Not all dental marketing is ads. There are a lot of things you could be doing for your patients easily and make a huge impact.